Yesterday, the great Kennedy clan laid one of its own to rest — Mary Richardson Kennedy, estranged wife of Robert F. Kennedy, Jr. — with the likes of Larry David, Susan Sarandon, and hotelier Andre Bálazs in attendance. She was “the most extraordinary woman,” RFK Jr. eulogized to the crowd of mourners at her funeral yesterday, which also included the couple’s four children, his mother Ethel, and cousin Caroline. Mary suffered from depression, and it’s a disease that so many, many, many Americans suffer from. That’s what Mary did her whole life. She was battling those demons and keeping them out of the paradise that was Mary. Notably absent from the service, held in the small town of Bedford where she lived, were Mary Kennedy’s six siblings and the rest of her family. 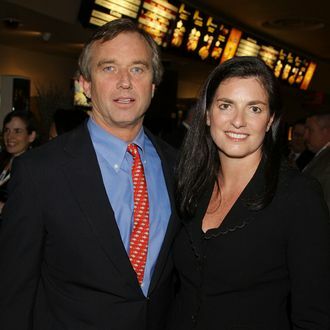 Since 2010 when divorce proceedings between RFK Jr. and her began, Mary Kennedy had been in the process of of de-Kennedy-ing. Which is why, just a day after she was found dead, hanging from a rafter in the barn of her Westchester estate, her family sued in court for custody of her body. But Friday afternoon, Mary Kennedy’s body was released to her as-yet-husband, and late last night she was put to rest in the same Massachusetts cemetery as Sargent and Eugene Shriver, in one of eight plots purchased by RFK Jr. on Friday.